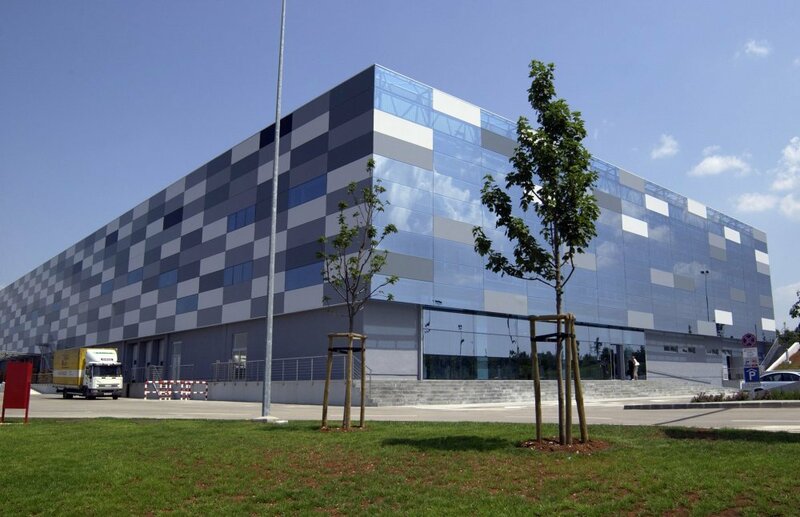 As a part of the Tobacco Factory Rovinj in Kanafanar, the reconstruction and extension of the hall is under development within the existing factory complex. For the construction, it was necessary to execute the open pit protection, so we carried out geotechnical exploration and investigations for this purpose and made the main and the detailed design. The Kanfanar municipality is located in the central part of Istria, which features predominantly flat cultivated areas indented with numerous smaller gardens. The specialty of this area is Limska draga, which stretches as a deep cut from the Pazinska jama from the north and passes through the municipality, in the length of approx. 10 km, to Lim Bay on its western edge. Limska draga and Vrh Lima connect the communal area with the Adriatic Sea. The municipality of Kanfanar is the area of ​​the coastal and inner Istria connection and as such represents the area of ​​special traffic and economic significance. 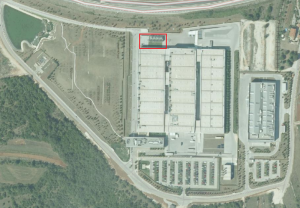 In this area, in 2007, a 123 million-euro tobacco factory begins its production in an area of ​​45,000 square meters. For the need of capacity increase, reconstruction and extension of hall 3 is planned within the existing factory complex. The floor area of ​​the extension section will be approximately 1200 m2. The total height of the building is 15.85 m and the planned cutting under the existing hall is about 3.50 m.
For the need of reconstruction and extension exploratory drilling and geoelectric and Georadar (GPR) surveys were carried out. The investigation has shown that the site consists of two litostratigraphic units, which are made ground (limestone fragments and clay – “terra rossa”) and the bedrock (bedded limestones). Based on the proximity of the extension, it was necessary to foresee a vertical excavation of the construction pit next to existing hall. 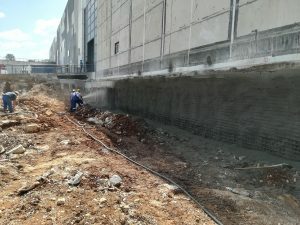 Based on the established lithological profile and space constraints, we have performed additional geotechnical investigations with the aim of determining foundation conditions and the geometric features of the foundation of the existing hall. Additional geotechnical investigations consist of four excavation pits at the base of the foundations of the hall. 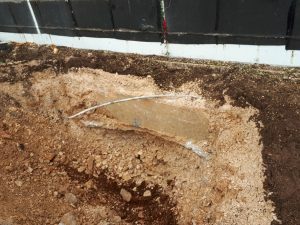 It was determined that the foundations were built within the made ground which conditioned an open protection to prevent underpinning in the excavation phase and the potential damage and costly remediation of the foundations. The open pit protection consists of reinforced concrete drilled piles with a diameter of D = 310 mm. The distance between piles is 80.0 cm to 100.0 cm. 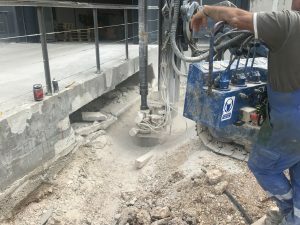 The piles are execute through made ground and the bedrock with impact rotary drilling technology. On our You tube channel you can see a short video of pile drilling process. After drilling, steel profiles IPE 160 of steel S235 and concrete with a compression strength class C 30/37 were installed in the borehole. The piles are executed from the bottom of the existing foundation to a depth of 1.75 m below the open pit bottom. 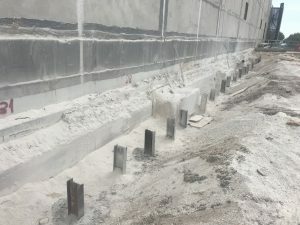 The total length of reinforced concrete piles is L = 4.60 m and 4.75 m with length of steel profiles L = 5.0 m.
For the purpose of connecting the piles, reinforced concrete beam (dimension 35×50 cm) was executed. 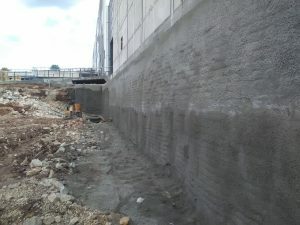 On the front face of the pile wall, a layer of shortcrete with a compression grade C24 / 30 thickness of 2.0 to 5.0 was applied. A layer of reinforcement mesh Q-283 was executed on the pile wall within the made ground and up to 30.0 cm below the rock mass level. After successfully finalising open pit protection, construction of the hall has been continued.